Description: You are invited to a feast for the senses and the spirit Thirty-four adventurous writers open their kitchens, their recipe files, and their hearts to illustrate the many unexpected ways that food draws us closer to God, to community, and to creation. All bring a keen eye and palette to the larger questions of the role of food--both its presence and its absence--in the life of our bodies and spirits. Their essays take us to a Canadian wheat farm, a backyard tomato garden in Cincinnati, an organic farm in Maine; into a kosher kitchen, a line of Hurricane Katrina survivors as they wait to be fed, a church basement for a thirty-hour fast; inside the translucent layers of an onion that transport us to a meditation on heaven, to a church potluck, and to many other places and ways we can experience sacramental eating. In a time of great interest and equal confusion over the place of food in our lives, this rich collection, which includes personal recipes, will delight the senses, feed the spirit, enlarge our understanding, and deepen our ability to "eat and drink to the glory of God." Featuring the writings of Robert Farrar Capon, Wendell Berry, Lauren Winner, Luci Shaw, Andre Dubus, Jeanne Murray Walker, Brian Volck, and many others, INCLUDING ORIGINAL RECIPIES Endorsements: "I'm trying to resist the temptation to pun--describing this as a rich feast of essays, or essays one will relish with delight, or essays that one should savor, and so forth--but I can't. This collection is a meal for the mind." --Mark Galli Senior Managing Editor Christianity Today "This is a gift to the Body of Christ--delicious prose and glistening dishes to assist the necessary recovery of our whole persons. As Saint John Chrysostom proclaims: 'The table is rich-laden; feast royally, all of you The calf is fatted; let no one go forth hungry Let all partake of the feast of faith. Let all receive the riches of goodness.' Taste and see, indeed." --Scott Cairns author of The Compass of Affection "From the sheen on the belly of a fresh-caught salmon to the reassuring heft of homemade bread straight from the oven, this new collection by thirty-four outstanding writers opens by celebrating the sheer joy of eating, then ushers us into the realm of holy sacrament. The Spirit of Food, edited by Leslie Leyland Fields, is not only rich in wisdom gained the hard way--through the gathering, growing, and preparing of what winds up on our multifarious tables--but shines with luminous gratitude at the abundant graciousness of God." --Paula Huston author of Forgiveness: Following Jesus into Radical Loving "Leslie Leyland Fields has done those of us interested in The Spirit of Food a great service by collecting thirty-four wonderful essays and recipes. Her careful choices remind us of the many ways God can be present in the human experience of eating. 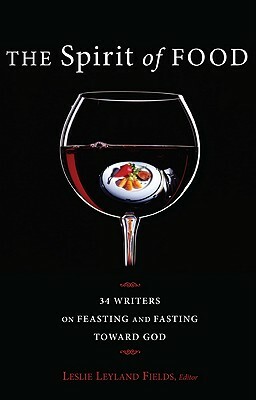 The essays on fasting, feasting, and the Lord's Supper join others which recall the experiences of grace or the call for justice which occur in everyday meals." --Shannon Jung author of Food for Life: The Spirituality and Ethics of Eating "I loved reading all these wise, honest, and funny people writing about eating--the conundrums and efforts and delights involved in our relationship to food, and God, and God-as-food. It's a beautiful and inspiring collection of essays. I've been praying and eating better since reading it." --Debbie Blue author of Sensual Orthodoxy About the Contributor(s): Leslie Leyland Fields is the author of seven books, including Surviving the Island of Grace: A Life on the Wild Edge of America and "Parenting is Your Highest Calling" . . . and 8 Other Myths That Trap Us in Worry and Guilt. She teaches in Seattle Pacific University's Master of Fine Arts Program and lives in Kodiak, Alaska.